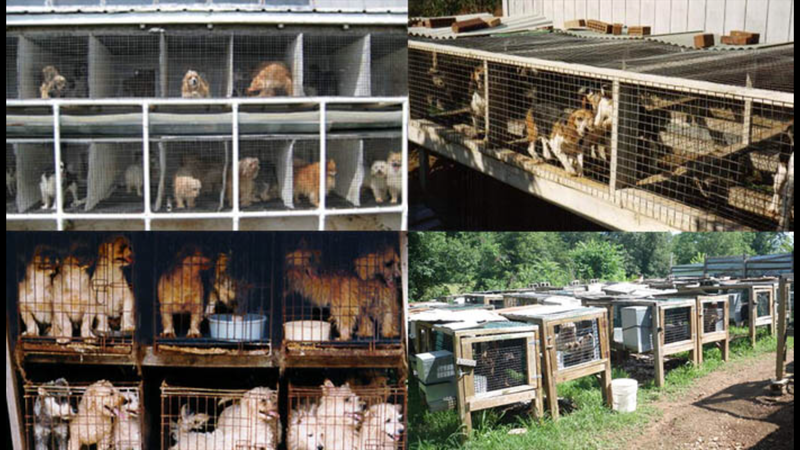 This is every story or blog I do as it pertains to dogs and other animals, both in my life and in the world. Towards the end of last year I made a decision I was going to try Mounted Archery. What the HELL was I thinking?!?! Don’t get me wrong, I think the sport looks amazing and I’m looking forward to trying it, but seriously, me? The one who still competes in the walk – trot division at the fun show? Me, the one who has a panic attack before throwing my foot into the stirrup EVERY time? Now I think it’s smart for me to attempt something where I have to let go of my reins and trust me connection with my horse, trust my ability to balance without falling (yes, I know balance has nothing to do with holding the reins but in my mind it does! ), trust myself to do this at any speed faster than a walk? I cannot believe I’m thinking this is a good idea. I love my horse, Luke. He is an wonderful boy. I adopted him November 2011 from an amazing horse rescue, Crosswinds Equine Rescue, Inc, and have loved him from the moment he arrived in Kansas City. I took lessons, I worked with him, I try to get him the best feed, I do what every good horse owner should do, except deal with the mental block that keeps me from becoming a better rider. Luke has never done anything to make me feel like he isn’t there for me. Just the opposite really….when I’m in the saddle, he’s different. He’s slower, he’s steady, he seems to sense I want calm, and for the most part, gives it to me. When a stronger rider is on him, he goes into a more spirited version of himself and responds accordingly. I made a decision last year. I decided I was going to STOP saying “I’m a bad rider” and figure out a way to change it. The first thing is to figure out what I would enjoy doing with Luke. I have learned I don’t truly enjoy trail rides with my friends but I do enjoy the controlled environment of arena work. Now this may be a “what comes first, the chicken or the egg” situation, meaning I might not like trail riding because I’m not confident in the saddle, but if I get better in the saddle, I might enjoy trail riding. Time will tell. The second thing is, I have to pick something or some things to do which will result in me wanting to be in saddle more. I had taken a tracing lesson last year with Brandy Von Holten and truly admire her as a person as well as an equestrian. I saw where she was going to be doing a ground zero archery clinic this spring and my curiosity was piqued. I liked archery as a child, hadn’t done it as an adult, but thought it sounded interesting. A decision was made. I was going to try mounted archery! I started where every decision seems to lead; the internet. I searched everything I could find on archery, mounted archery, equipment, techniques, etc. I didn’t want to put a lot of money into it in case it wasn’t something I enjoyed and, let’s face it, budget always has to be a factor. I found a bow for a reasonable price and asked my mom for it for Christmas. Since I’m her favorite daughter (ha ha, now I’ll know which sisters read my blog. I know I’m not her favorite, she loves us all equally….blah blah blah 😂) she, of course, said yes. The bow took a LOT longer to arrive than expected, I won’t go into details but it was ordered the beginning of December for a Christmas delivery and I didn’t get it until February. Once I had it, I needed to find arrows and other items just to get started. I read where real feathers for the fletchings are better but they are also more expensive. I didn’t even know if I was going to be able to shoot this thing! Oh yeah, let’s talk about this bow for a second. Mounted Archery requires you to use a traditional bow, similar to the Mongolian style….with no shelf! It’s bad enough you have to shoot at a target while you are moving, on a horse, but you have to do it with a complicated bow! Again, what am I thinking? After a long search, I decide to order some arrows off of Amazon. I always make sure to use smile.amazon so a portion of my purchase goes to a rescue of my choice. I have Crosswinds Equine Rescue as my rescue I support. I figure they are too far from me to give of my actual time, so it’s only fitting I give back to them this way. I chose the arrows I did because they were reasonably priced, bright colors, and would be good for basic ground practice in the beginning. I watched a few YouTube videos to help me understand exactly how to shoot this crazy bow with no shelf. I appreciated BackyardBowyer for his simple approach to teaching how to hold the bow and shoot it. I watched a few of his videos and decided I was going to try the off the thumb method because it made the most sense for grabbing and positioning the arrow while moving. I ordered a leather thumb ring when I ordered the arrows and waited patiently for the to arrive. My plan was to practice from the ground first before even attempting to add Luke into the equation. Let’s face it, dropping an arrow on my horse would not be a good thing. I found an archery target at Wal-Mart marked down to $8.50 and went to pick it up. I now had everything I needed to attempt to shoot. A friend of mine is also trying this and said we could go out to her dads to try but I was excited so I set the target up on top of my outdoor trash can, walked back about 10 feet (I figured I’d start simple since I live in the city, didn’t want to risk my neighbors) and drew back my first arrow. THUNK! It totally missed my target and bounced off my privacy fence. Oops. Arrow # 2. Repeat of 1. Arrow #3….another repeat. This isn’t looking good for me. Arrow #5 HIT!!! Yes! I could do this! Arrow #6….repeat if 1-4. In total, I hit the target twice. Not a complete fail but not good either. I decided for the sake of my arrows, my privacy fence, and my neighbors safety, I would stop practicing in my back yard until I’m better and find a more suitable place to practice. I’m nervous beyond belief of this endeavor but also very excited. My archery clinic is in April so I have some time to practice before then. I’m hoping this is the year I go from “I’m not a great rider” to “I’m looking forward to riding” I’ll still do the fun shows in Oak Grove, MO each month like I have every year. I’ll stay in the walk – trot division this year and I’m ok with it. I may even consider doing some obstacle competitions this year. I just want to enjoy time with my horse ON my horse. I want to focus on moving forward and not letting fear or nervousness keep me from doing something I believe I will truly enjoy. Have you tried Mounted Archery? Have you ever been nervous mounting? What are some things you enjoy doing with your horse? I’d love to hear your stories. Feel free to share in the comments. Wish me luck on this new adventure. I’ll keep you posted! As my summer with mom draws to a close, it was time for me to head back to Kansas City, Missouri from Port Huron, Michigan. I rented a car from Hertz like I normally do. I wasn’t as happy this time about the rental price, but that is another story. 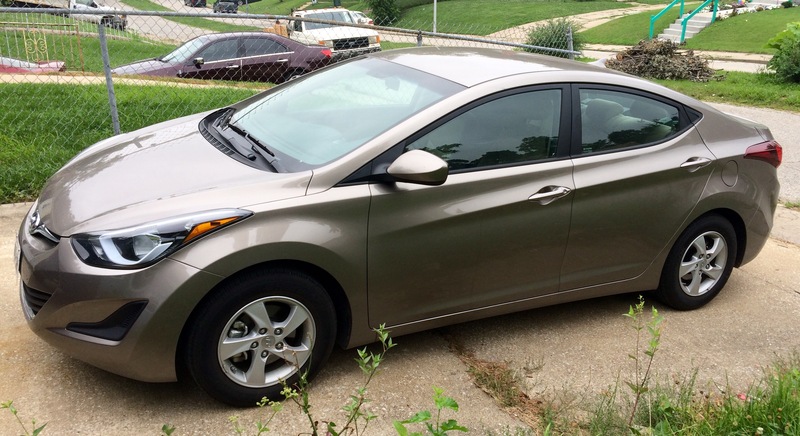 I had picked the group “Toyota Corolla or similar” and ended up with a 2015 Hyundai Elantra. I have some question about the Elantra and the Corolla being in the same class, but Hertz, like any rental car, is never specific enough to give you an true answer and it wasn’t so far off that I feel like complaining again to them. Let’s talk about this car for a minute. The first thing I want to acknowledge is that it is a nice looking car. I’m really more of an SUV/truck person in general, but I do appreciate a decent looking car at a good value. The car has a nice sleek look to it. 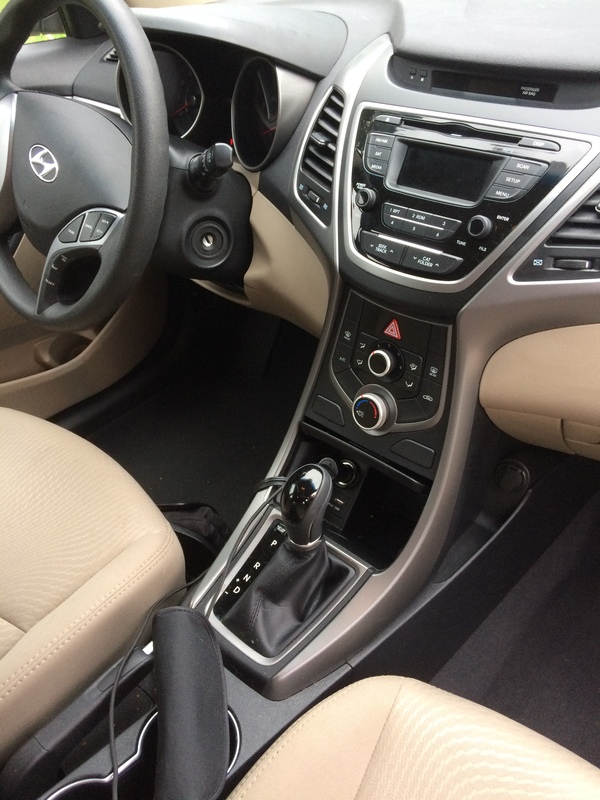 When I got in to drive away, I was impressed with the amount of legroom when you put the seat all the way back. I’m 5 foot 10, so plenty of legroom, especially for a long drive, is very important. I still don’t like how low it is to the ground, like I mentioned in a previous rental review, but again, I’m used to being higher up in my mini suv. Headed to my moms to pick up my luggage I didn’t have a real chance to check the vehicle out, as it is a straight shot on a normal road. The brakes were crazy intense though! I barely tapped them and the car jolted to a stop! When I start loading the luggage, I was impressed with the amount of trunk space there was. I am not the neatest packer, especially on car road trips. As long as everything can shove in the trunk I am happy! 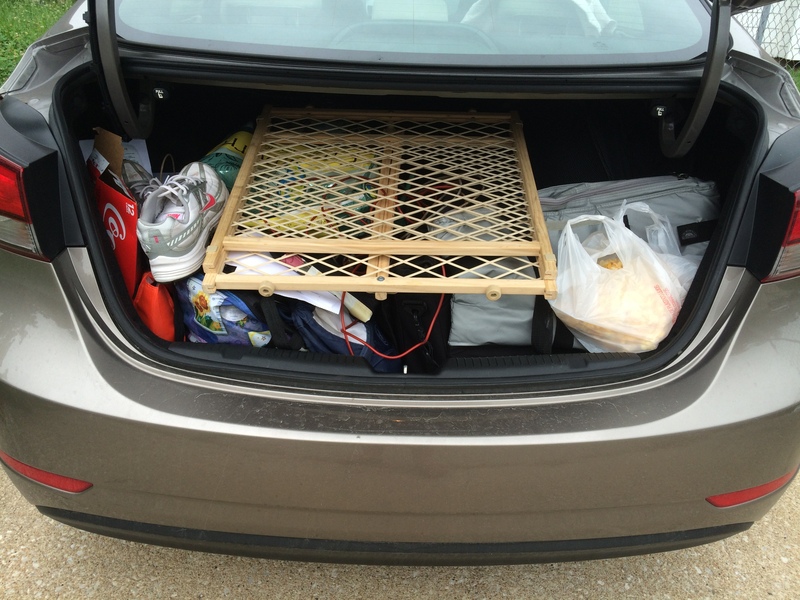 Because of this, I appreciate ample trunk space. I fit my suitcase, a duffle bag, a baby gate (for the dogs), a 30 pound bag of dog food, two tie outs, the dog’s travel bag, my laptop bag, a pair of shoes, some miscellaneous small bags, and a big Sam’s Club thermal tote with some food in it. Since it’s a rental, I covered all of the seats in sheets and blankets. Filled the dogs water cooler and put it in the back, on the floor. Loaded the dogs up and we were on our way. The backseat must not be too bad, because Bella was not as restless as she was on the trip six weeks ago in the rental car. 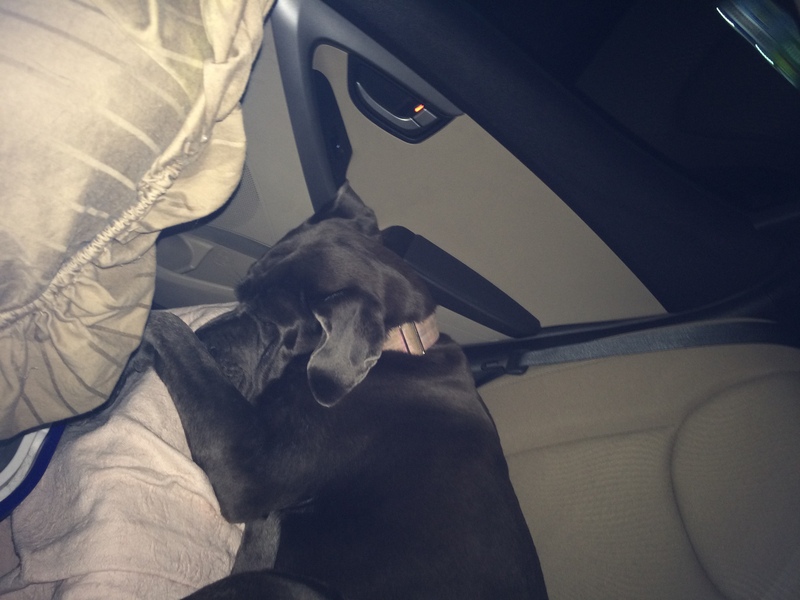 She only wanted her head out the window for about two minutes and then settled in on the seat and fell asleep. Zipper crashed in his normal place on the floor of the backseat. When I first hit the expressway, I was a little concerned as the car seemed to want to sway back-and-forth quite a bit. There wasn’t a lot of wind, so I wasn’t really sure what caused it. All I knew was it was going to be a long drive if it continued. After a while, I began to think maybe it was me, because it seemed to get better as we drove along. There is an interesting feature I found on the car, you can choose what mode you want to drive it. The options are normal, Sport, and Comfort. I’m not going to lie, I played with it a few different times on the road, and I honestly couldn’t see that much of a difference. The steering wheel might be a little tighter in sport mode but it was very minimal. I have to drive from Port Huron, Michigan to Kansas City, Missouri pretty down pat. I usually know where I’m going to have to stop, I know when I’m a third of the way, I know when I’m half way, especially when I’m doing the drive overnight. As I was crossing Michigan, I was on the phone and realized that I had already been on the road about four hours and the gas tank was still at half a tank. I couldn’t believe it! I made it all the way from My mom’s house, to Kanake, Illinois before I had to stop! It wasn’t because I needed gas, it’s because my bladder gave out before the gas did. It only took 10 gallons to fill it back up and we were back on the road. I noticed I still had 447 miles to go until I reached my home, and the car was saying I had 417 miles to empty. Had I waited another half an hour, I would’ve only needed to fill the vehicle up once for a 12 hour drive! That is pretty impressive. In looking at the gauges I averaged about 36.8 to 38.4 miles per gallon. Not too bad. As I have mentioned before, I am not a small woman. The seats were not the most comfortable in my opinion. The edges kind of dug into my outer thighs a little bit so I found myself shifting a lot. Perhaps if I had a vehicle with power seats, it might have been a little better because I could have raised them up a little, but I doubt it. I found myself sliding down in the seat quite often and then having to shift myself back up. It’s just not comfortable when you’re wearing a pair shorts! 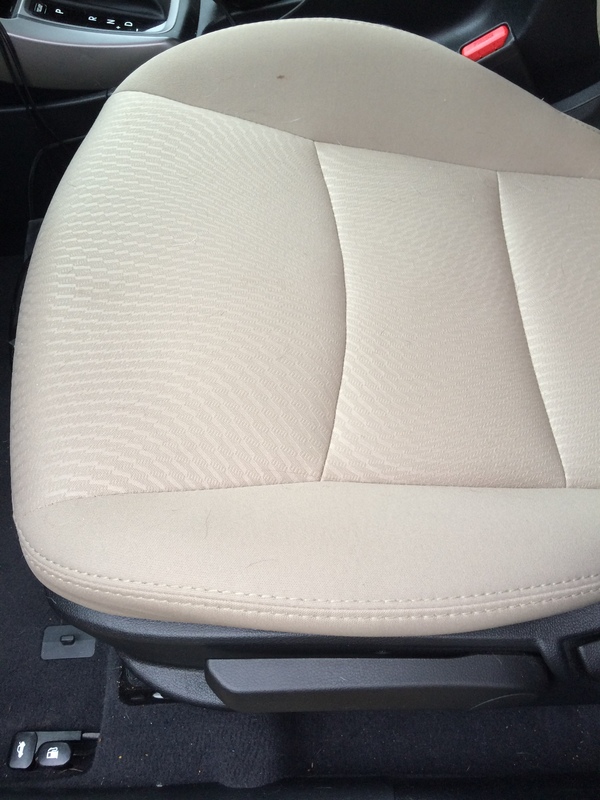 Another complaint I had which I have often in cars, is the position of the center armrest and the side armrest; there is no comfortable way for me to rest my arm on it while I’m driving. They were both way too low. I found myself bringing my left leg up and resting my arm on it while I kept my hand on the steering wheel. For some reason I don’t seem to like the cruise control on this vehicle. I can’t explain it, but I feel like I was constantly tapping my break and shutting it off and then driving with my foot on the gas again. I hit a little bit of rain at one point in the drive, and the vehicle handled it pretty well. I had control of the vehicle at all times. The headlights were weird. I know that sounds strange, but I had difficulty figuring out if my lights were on or not! I drove at least an hour and a half to two hours with just my parking lights on until it got dark enough for me to realize I didn’t have my actual headlights on. What threw me off was it looked like they came on automatically because the dashboard lit up a little differently when I got dusk but it didn’t look like any lights were on the outside so then I flipped the switch and saw a slight change on my dash and what I thought were lights on the car but then, like I said, it was only my parking lights! Oops! Oh well I eventually figured it out. The mirrors on the side are very nice, they are a good size, and the driver side has a little mirror insert in the upper left hand corner so you can see the road from two different perspectives. The gauge lighting is nice, you have a clear indication of your fuel, you can toggle between your trip Miles, your miles per gallon, how many miles to empty, what your average rate of speed is, and how long you have been on this trip. It was easy to reset each one of them when I started my trip. As I am a huge fan of the color blue, I was happy to see that most of the lights on the dash were a nice navy blue tone. Accented with white or a lighter shade of blue depending on which one you were looking at. 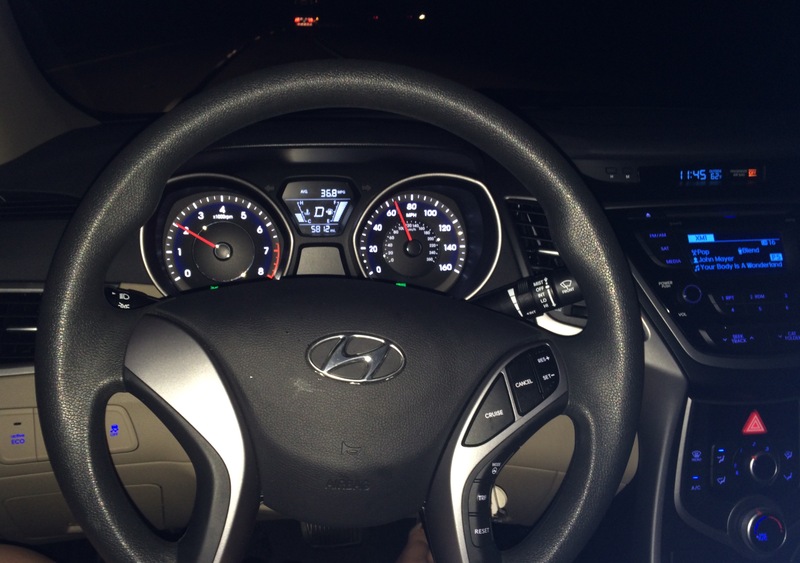 The steering wheel has a nice assortment of gauges on it including your cruise control your emotions to go between the different styles of driving, your trip information and you can quickly reset it from your steering well. I was surprised to not see any radio controls on the steering wheel, not sure if that is an option that can be added on different models or not. The one thing I found weird though was that the controls were all on one side, so when you’re driving at night, it just didn’t look symmetrical. If you have a case of OCD, I’m sure it would annoy you a little! It has a sunglass holder up near the roof along with nice lights that are easily accessible and easy to turn on for the interior, I know they’re easy to turn on because Bella‘s big head turned them on more than once when she decided to walk around a little bit and try to move to the front seat! I said try, because she wasn’t successful, but she did hit the light! You have a 12 V plug along with a USB plug and in auxiliary plug all at your fingertips. The USB plug is a very nice touch. There is a small area to the right of the plug to put a few things. I put my Bolle` sunglass case in it though and it pretty much filled up the area, so it isn’t very big. The center armrest also opens up for additional storage, but I don’t like to put things in there for a rental car because I don’t want to forget them. There is another 12v plug just off to the right so a passenger could also plug something in. I forgot to look to see if any were in the back seat or not. 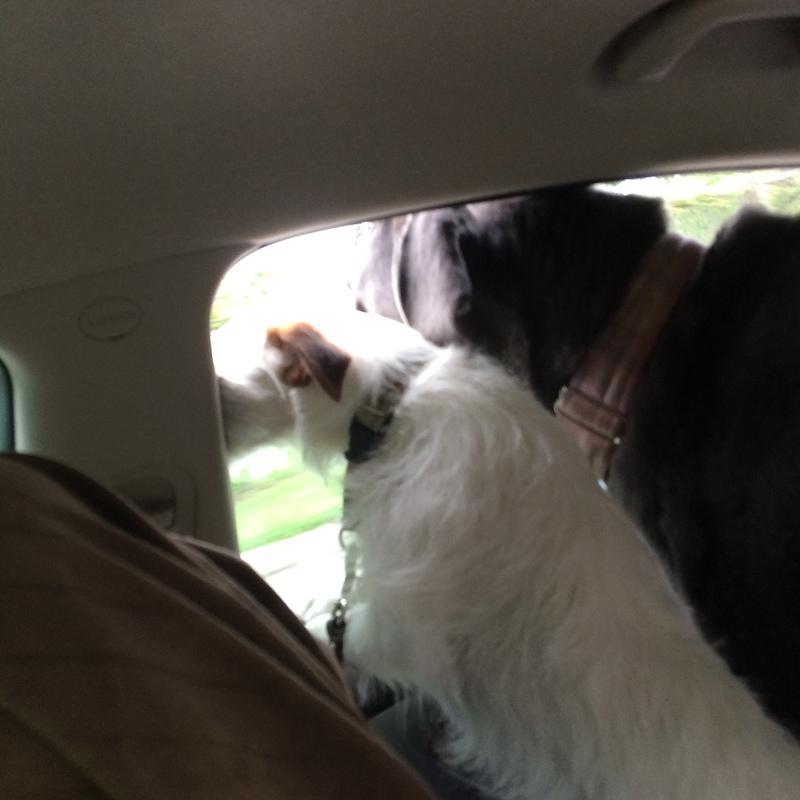 Both Zipper and Bella were able to fit their head out of the same window when we were closer to home! 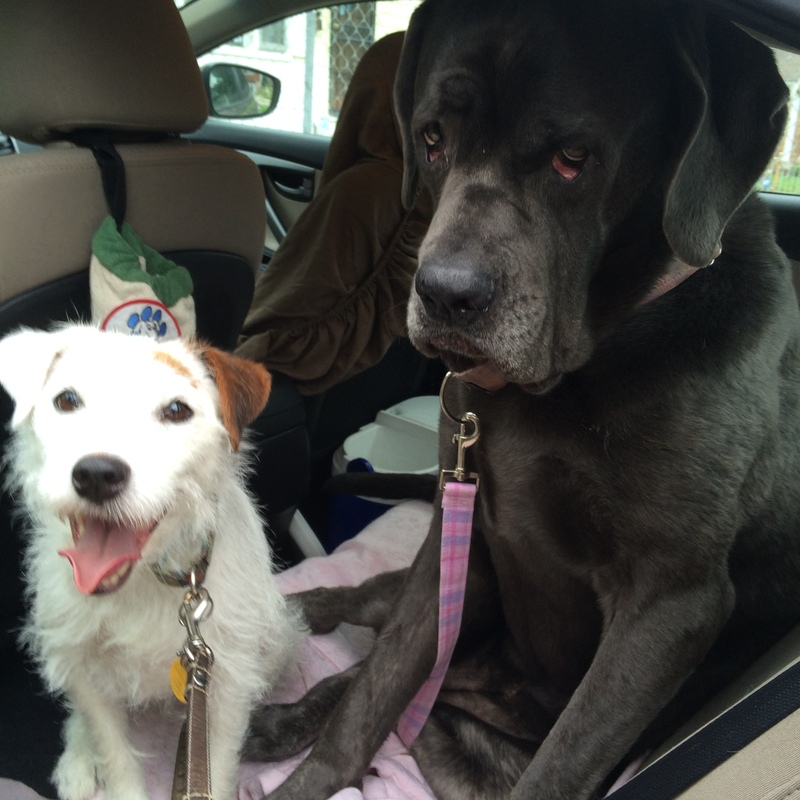 Bella and Zipper happy to be home after 15 hours in a car. You can see the water cooler on the floor behind them. Would I purchase the car? No, it would be too uncomfortable for me long term, but for one or two people (or skinny people) renting a car, it might be a good choice. I hope this review helps you! Share your comments and thoughts if you have this car or have driven one? This is the door leading to my mom’s room. We had just come downstairs ourselves and I sat on the couch to search social media. I heard the click of the brake on my mom’s walker so I knew she was up and moving around. 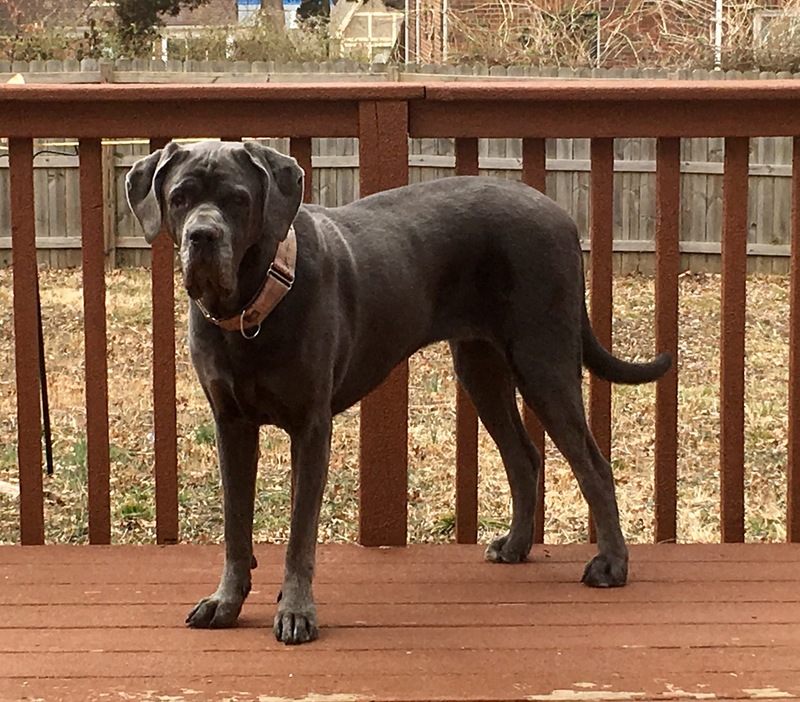 Bella, my Neapolitan Mastiff, must have heard the click as well because all of a sudden I heard the thump thump thump of her tail hitting my hardwood floor. She gets so excited when my mom is around. When my mom comes out first thing in the morning Bella does a polite excitement. I love it. Her whole body will wiggle, she spins a little. She’ll mouth my mom’s hand (which is on the walker) softly until my mom says “no”. She never pushes her or jumps on her like she sometimes does to greet others. It’s as if she knows she cannot handle it. Once my mom is seated, Bella will be right in front of her, tail wagging. My mom will pat her on the head, say “I love ya Bella” and then sometimes the whole interaction is over. Bella goes on her way. I don’t even think my mom has realized this daily ritual between the two. It’s not just the mornings. Bella will greet her with a toy if my mom has gone into her room to use the restroom. Bella will wait until she’s seated and bring a toy, usually a long stuffed animal or her long rope toy. My mom will take it and, with her arthritic hands and shoulders, attempt to throw it. It never goes very far but Bella doesn’t care. She’ll jump like she’s getting ready for a major sprint and pounce on it, grab it, and bring it back. It only lasts one or two throws and then Bella, content, will walk away with it and lay on the ottoman. It never ends that quickly when I’m throwing it for her! So here we are. My mom will be out soon. Bella is waiting patiently for her. She has moved from being over by me to taking the spot in front of the door. She will be the first one to say good morning! With Bella’s size, she doesn’t get to interact with my mom as much as Zipper does. Zipper is small, he can jump up next to her. Bella has found her own way to share time with my mom. She has found her own way to work into her heart. The love of an animal knows no age or disability. 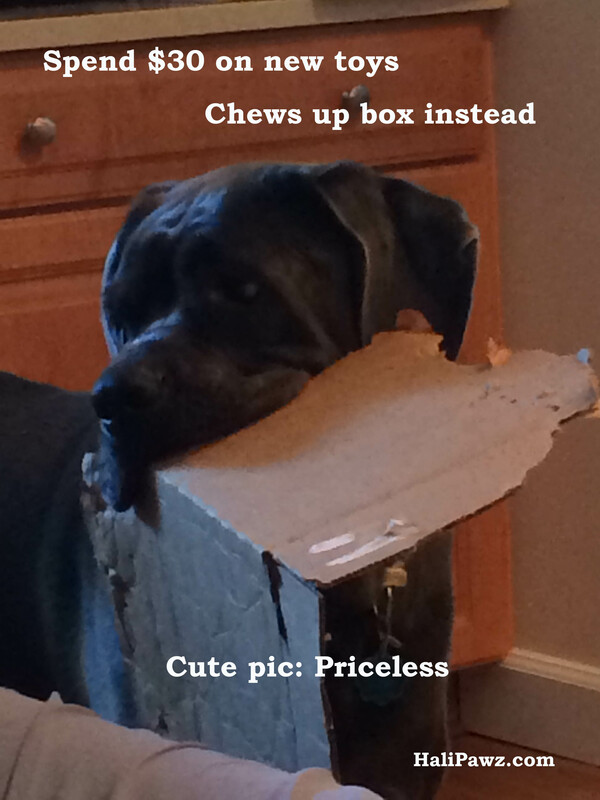 My dogs love cardboard. 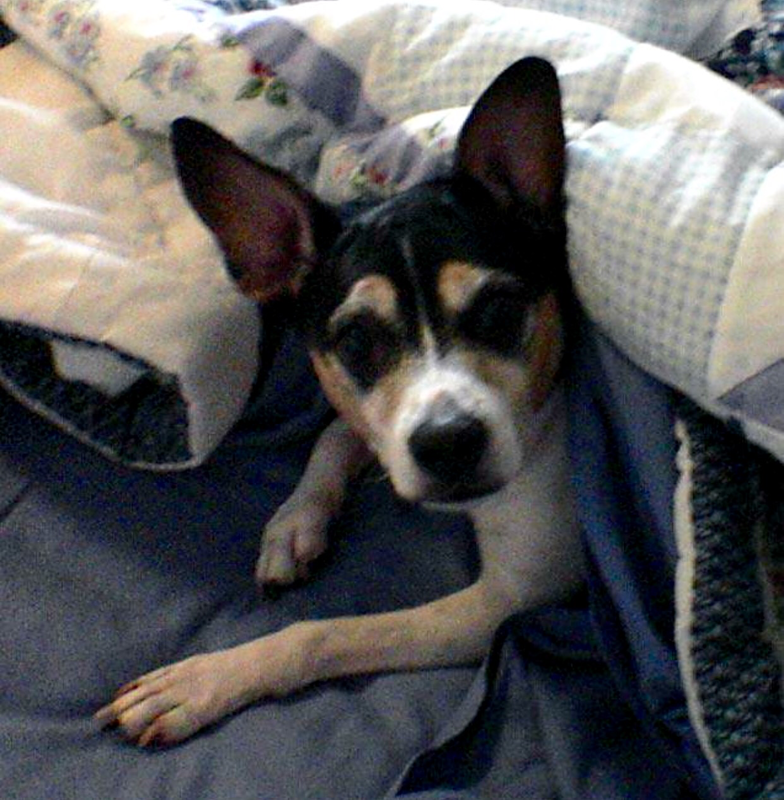 Zipper, my Jack Russell, will rip open any box he can sink his teeth into in order to see if there is anything in the box for him. I have ordered toys from the Horseloverz auction for them. When the box arrived, I put it off to the side and got busy with other things. I left the house, came home, only to find the box open and two of the dog toys destroyed already! 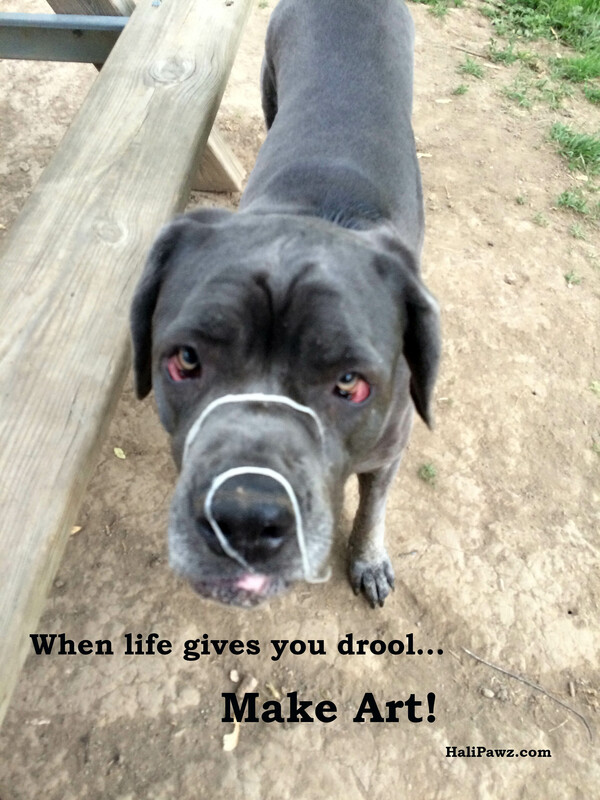 Bella, my Neapolitan Mastiff, doesn’t seem to care about the toys, instead, she has a love of cardboard boxes. She will snag any piece of cardboard she can and walk around with it like it’s the best toy she has ever been given. I love my fur babies. It is never a dull moment with them around!